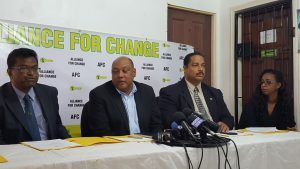 The Alliance For Change (AFC) will next month formally decide whether it will be contesting this year’s Local Government Elections (LGE) on its own and such a move will influence if it will engage A Partnership for National Unity (APNU) in a revised political agreement, a top AFC official said. AFC General Secretary, Marlon Williams said while his party has already named its team to negotiate a revised agreement known as the Cummingsburg Accord, the party is engaged in intensive internal discussions at all levels ahead of its National Executive Committee (NEC) meeting scheduled for mid-February. “Part of our discussions is that we are in preliminary discussions with the APNU but we cannot go into a discussion without knowing exactly what is the way forward for a key component of this coalition; the key component in this instance is that of the Local Government Election. What we are waiting on is the verdict from the NEC as to what is the position for the Local Government Elections and then when that is through, we will deal with the other issue,” he Demerara Waves Online News. Williams stressed that the AFC was “passionate about the coalition and we do enjoy the great work that the coalition has been doing thus far” in moving Guyana forward, but the delay in key decisions related to interfacing with APNU was due to its democratic methodology in decision-making. After the signing of the Cummingsburg Accord on February 14, 2015: David Granger of APNU and the AFC’s Moses Nagamootoo. Williams’ disclosure followed President David Granger on Wednesday saying that he was yet to receive any formal indications from the AFC that it is ready to negotiate a revision of the political pact with APNU which he chairs. Granger has also said the AFC was yet to inform APNU that it would be contesting this year’s Local Government Elections (LGE) alone. Granger told reporters at State House that APNU was willing to enter into talks with AFC on a revised Cummingsburg Accord that the two sides inked on February 14, 2015 three months before general and regional elections in that year. So far, the AFC has been saying publicly in the media that it has established a negotiating team to meet with APNU, but Granger, who is also leader of the People’s National Congress Reform (PNCR)- the largest of the six parties in the governing coalition- needs to do more than that. At a time when sources said the PNCR was toying with the idea of contesting the LGE on its own but eventually agreed to do so with the four other smaller parties in the APNU umbrella, Political Scientist, Freddie Kissoon reasoned that the largest and most influential PNCR was rationally keen on having the AFC and APNU/PNCR show its political strength at the polls ahead of the 2020 general elections. Kissoon forecasts that the AFC, which occupies 20 percent of the 33 parliamentary seats in keeping with the Cummingsburg Accord, would perform poorly at the neighbourhood/ village councils. “I am very sorry to say this: I think it may very well be the death toll of the AFC. I wish the AFC well but I would like to know where those NDC votes are coming from for them to carry out an NDC victory in the Local Government Elections. They aren’t going to win where the PNC is strong but they would have t pick up dozens of NDCs but I am not too sure they could do that; it is too late,” he said. Asked what would be the AFC’s future if it performs poorly at the LGE expected during the last quarter of 2018, Kissoon said the question would be why why should APNU coalesce with that party if it cannot bring in votes from traditional PPP areas along the coasts and hand it seats and significant ministries. The APNU/PNCR’s analysis has turned up serious concerns about its supporters being sidelined while the AFC has been holding important ministries and other offices. At the same time, the former University of Guyana Political Science lecturer said APNU’s reasoning might be that with or without the AFC it would be unable to win the 2020 general elections. “My position is that APNU+AFC cannot win- the election is not guaranteed. I think what the PNC is saying ‘ why are we patronizing politicians who cannot cause us to win the elections in 2020’ so what they may do is accept their fate that they cannot get Indian votes and they would hope to go over the 50 percent through Amerindian votes with a certain amount of abstention by anti-PPP Indians,” he said. Political Science Professor, Henry Jeffrey, however, said the PNCR would not want to contest an election on its own regardless of its expectations about the results “because it would make its outcomes much more clearer to the public so it won’t want to go into the elections alone.” He noted that the PNCR did not so well in the 1994 LGE. “It’s going to tell a tale for the national elections if they go to the (LGE) elections and do badly, they can’t in a year run in to the national elections and say they won,” said Jeffrey, a former supporter of the PNC and the PPP. In a move aimed at broadening its base, he said the AFC could opt to criticise APNU publicly and endorse smaller groups and independents. AFC General Secretary Williams is confident that on its own his party could win significant votes like it had done in 2006 and 2011. 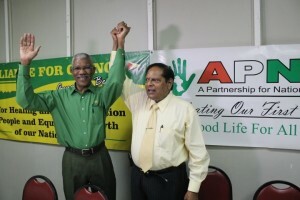 Before coalescing with APNU, AFC co-founder Khemraj Ramjattan had feared that to do so would have resulted in an alienation of Indo-Guyanese supporters who who had shifted away from the PPP.